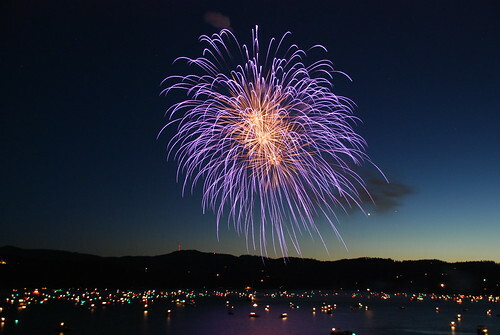 If you live in the Coeur d’Alene or Spokane area, you already know that spending the fourth in Coeur d’Alene is one of the best events of the year. The lake provides a perfect backdrop for a day of fun and sun, and an awesome fireworks display to top it all off. 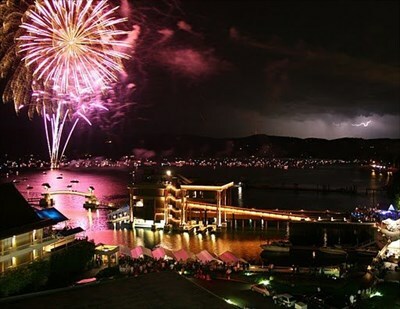 Coeur d’Alene is a great place to spend your fourth of July; for families, for friends and everyone in between. The City of Coeur d’Alene puts together a day of great activities for the 4th Of July Festival, beginning with the Independence Parade at 11 and live music in the park that lasts all day. The beach and downtown are very crowded all day, and if you are staying in a vacation rental downtown, I suggest just walking instead of trying to drive anywhere. If you plan on watching the fireworks around 10PM, plan to head downtown at least 2-3 hours early. Usually by 4PM parking in downtown is completely full and many roads are blocked off. Expect to walk at least a couple miles to downtown if you head in last minute. The beach is my favorite place to spend the fourth. At Independence Point on City Beach the steps are always a fun place to meet people and enjoy the sunshine and swimming. The main beach is very crowded with dogs, families, couples and both young and old attendees. Tubbs Hill is also a fun place to spend the day if you want to hike a little, enjoy the cliff jumping and coves and beaches. During the day Tubbs Hill remains fairly tame, but at night, especially after the fireworks, it is very dark and people are loud and rowdy. Be sure to be safe on the trails when leaving Tubbs Hill after the fireworks if you plan to watch them there. Whatever your plans may be for the 4th, our area is a perfect place to spend the holiday. If you want to avoid the crowds of CDA, venture into Post Falls, Liberty Lake, Hayden or Spokane for their fourth of July celebrations. No matter where you decide to spend your Independence Day celebration, North Idaho is a wonderful choice.